Mahoujin Guru Guru is probably the craziest, wackiest anime I've ever seen. Slapstick is constant - nothing is ever serious for more than a minute, if that long. In Plain Old Village (that's actually the name), Nike has been undergoing &quot;training&quot; since he was very small, as his parents are adamant that he become a dashing hero someday. Conveniently, just as the boy has grown old enough to take care of himself (age 13), that's when all the trouble starts. When his dad finds out that the king is looking to recruit a hero to deal with this resurrected evil, one thing leads to another and Nike meets magic user Kukuri. Though cute, soft-spoken, and pretty much idolizing her new friend, she has a bit of an attitude and struggles to learn the Guru Guru circles. This leads to a lot of bizarre &quot;oopsies.&quot; You'll just have to watch to understand. Along the way of their journey, they'll meet many interesting characters. And by interesting, I mean insane. There's an old man dressed in a hula skirt who pops up at the most inconvenient times to do a disturbing dance. A sprite who wears a loin cloth. An incompetent hero wanna-be who couldn't fight a butterfly with a flame thrower. And that's just to start! Nike and Kukuri themselves frequently act the complete opposite of what their position implies. The artwork is adorable and fun, drawn completely &quot;chibi&quot; style except for a few instances. This can, however, make it hard to guess how old a character is at times. While most anime shrink the characters down for exaggerated emotions, this show actually grows them up to &quot;normal&quot; size. Overall, this is a very, very silly show in a universe that you could wake up in and think you'd eaten some bad cheese. If you're a fan of a good fantasy story and/or have ever played an RPG, you will definitely appreciate the jokes. If you like romance, there's a bit of that. If you like random and nonsensical, there's enough to choke a horse. Basically there's something for everyone. Highly recommended! One of my favourite animes of all time. It's a charming and light-hearted fantasy comedy that doesn't take itself too seriously. I've watched Spirited Away, Berserk, One Piece and many animes more highly rated than this one but to me this beats most of them. Every episode is such a joy to watch and it never failed to bring a smile to my face. No anime with a higher rating can accomplish this except for maybe Gintama if you exclude the nonsensical and plot heavy episodes. And as for its gag potential this one has episodes that made me gag as hard as some of Gintama's funnier episodes. 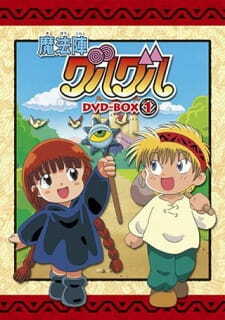 This is my first anime that I liked~ When i was young, there's only slam dunk and mahoujin guru guru which impressed me. It gives me a lot of inspiration. This anime also influence me into drawing. To be frank, I am not a fan of chibi but the way this anime present it (other than main characters *1/3, they're all normal*with 1/4,1/5 porportion)~ It is an anime that won't give you time to rest(you will laugh about every min~no time for you to breathe) Furthermore, it is something you won't get bore with ~ I watched the chinese version of it more than 20 times (i'm serious, I stopped watching it at my 20th because the disc start to lag). On the other hand, I suggest you to watch it alone in your room because there are many embarassing and childish scenes in it. I got laughed at because my big sis and bro saw me watching it~ well that won't change the fact that I like it. I still like it very much. In my case~ it worths buying it~ but becareful! the Mahoujin Guru Guru 2 is not the same at all!